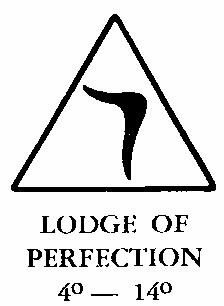 The Ineffable Degrees, from the Fourth to the Fourteenth inclusive, are conferred in a Lodge of Perfection. They are called “ineffable” because they are concerned with the ineffable or unutterable name of God and with man’s eager quest for the true name. These eleven degrees, based upon the legends of King Solomon’s elaborate teachings of symbolic Freemasonry, are applied to practical situations which we face in our everyday lives. The Fourteenth degree summarizes that which has been taught and is a moral and philosophical climax. 4º – SECRET MASTERThe Fourth Degree, Secret Master, is the first step into the inner sanctuary of the Spiritual Temple, where he who seeks, finds Truth. We are to learn the duty of obedience to the law of God or nature, the law that is an expression of the will and judgment of the people and for the benefit of the whole person. 5º – PERFECT MASTERThe Fifth Degree, Perfect Master, emphasizes two virtues, Industry and Honesty. Idleness is the great enemy of growth, whether mental or spiritual. One should always be honest in his contacts, sincere in his statements, and keep all promises and covenants even to his own disadvantage. 6º – CONFIDENTIAL SECRETARYThe Sixth Degree, Confidential Secretary, teaches us to be zealous, faithful, free from selfish motives, benevolent, kind, affectionate, broad minded, and charitable, keeping our thoughts only on the good and true with a feeling of thankfulness for all favors rendered. 7º – PROVOST AND JUDGEThe Seventh Degree, Provost and Judge, has for its chief lesson the great principle of justice. Those with the power of judgment should judge impartially, without personal consideration, prejudice, preconception, or haste. 8º – INTENDENT OF THE BUILDINGThe Eighth Degree, Intendent of The Building, teaches us that we have high duties to perform and a high destiny to fulfill on this earth. The jurisprudence, learning and morality of Masonry and not merely the work and Ceremonies should have our most profound thought and attention. 9º – ELU OF THE NINEThis Degree is consecrated to bravery, devotedness and patriotism. Its duties are summed up in “Protect the oppressed against the oppressor and devote yourself to the honor and interest of your country. 10º – ELU OF THE FIFTEENThis Degree is devoted to religious and political toleration and to the enlightenment of the mind and soul. Toleration holds that every man has the right to his opinion, and liberality claims that no human being can say he alone knows the truth. 11º – ELU OF THE TWELVEThe duties of this Degree are to be earnest, true, reliable and sincere, to protect the people against illegal impositions, and contend for their political rights. 12º – MASTER ARCHITECTThis Degree teaches us that truth is most divine of all human helpfulness. Life is what each man makes it. All our earthly transactions and institutions are based on faith in our fellow man. We must believe in a Supreme Being, an instinct in all races. No man can suffer and be patient, can struggle and conquer, can improve and be happy without faith in a just, wise and beneficent God. 13º – ROYAL ARCH OF SOLOMONWhether the legend and history of this degree are historically true or but an allegory containing in itself a deeper truth and more profound meaning, we shall not debate. If it be a legendary myth you must find out for yourself what it means. We know that for many centuries the Hebrews had been forbidden to pronounce the Sacred Name. It is therefore possible for the same pronunciation of the name of the Deity to have been forgotten or lost. Thus the communication of this knowledge and other secrets, some of which are perhaps lost, constituted under other names what we now call Masonry. But there is one application of this degree that you are entitled to know, remembering that Khurum the Master is the symbol of human freedom. It is not enough for a people to gain liberty, it must secure it. 14º – PERFECT ELUThis Degree is the last of the Lodge of Perfection and we have reached the point where each individual Mason must discover the secret of Masonry for himself. Perfect Truth is unattainable, yet we must ever press on, more nearly approaching it. We receive as much of the Divine Light as we are capable of understanding. God has arranged His great purpose so that each man has a work to do, a duty to perform, to help the progress of the great plan for enlightenment and growth. FOURTEENTH DEGREE RINGThe man who receives this Degree is entitled to its ritualistic ring. It is a plain flat band of gold having imposed thereon an engraved or enameled triangle enclosing the Hebrew letter “YOD” and the motto “Virtus Junxit, Mors Non Separabit,” (Whom Virtue Unites, Death Cannot Separate) engraved inside. We now give the ring encased in a pyramid of Lucite. To our ancient brethren of knightly orders, three things in this life were prized above all others: the purity of his honor, the integrity of his word, and the spotlessness of his shield. Honor that never broke faith, integrity in the defense of innocence and right, and the shield never to be sullied by protecting oppression and wrong. Scottish Rite Masons of this day have adopted the emblem of the Fourteenth Degree ring as a symbol that represents the sword, shield, and armor of the ancient brethren. This is the last degree of the Lodge of Perfection, which meets on the first Thursday of each month to conduct the business of all four bodies. All members are urged to attend. Chapter of the Rose CroixThe Fifteenth and Sixteenth degrees of Scottish Rite Masonry are known as the “Knight of the East” and “Prince of Jerusalem.” These degrees, sometimes referred to as the historical degrees, constitute an allegorical narrative presenting the story of a captive people who “wept beside the rivers of Babylon.” When liberated, they were consecrated to the task of building the second temple, or rather of rebuilding the original temple of Solomon, which had been destroyed by marauding Assyrians. The lessons in the fifteenth and sixteenth degrees are drawn from these elements of the historical drama which transpired during the reigns of the great kings, Cyrus and Darius. The Seventeenth and Eighteenth degrees are known as the philosophical and doctrinal degrees of the Scottish Rite. They offer a new development of Masonic teachings and are a distinct departure and advance from the symbolism and teaching of the symbolic lodge and of the preceding Scottish Rite degrees. These deal with the first temple and its supporting columns, and the attempt to restore them. The Rose Croix degrees are the spiritual center and among the most important in the whole body of Masonry. 15º – KNIGHT OF THE EASTThis is the first Degree of the Rose Croix, and the leading lesson is fidelity to obligations and constancy under difficulty. The chief stumbling block on the way to this is indifference of its own people and the world. We must therefore persevere even as the ancient brethren have done, notwithstanding all obstacles. We must pass through the darkness to reach the light. 16º – PRINCE OF JERUSALEMThe story of the rebuilding of the Temple at Jerusalem conveys to us the thought that the world and every noble heart is God’s Temple, and we should labor to establish the reign of love and peace, thus building a lasting temple to God. The work of the soul, developing the virtues of patience and gentleness ought to be as important to us as that of earning our daily bread. The beauty of Love, the charm of Friendship, the sacredness of Sorrow, the heroism of Patience, the nobility of self-sacrifice, make life to be life indeed, and are its grandeur and power. They are the priceless treasures and glory of Humanity. 17º – KNIGHT OF THE EAST AND WESTThis is the first of the philosophical Degrees. In all times truth has been concealed in symbols. It is from the Essenes that this degree is sprung. The Essenes believed that Truth was scattered throughout the world among different sects. They believed it was the duty of man to gather these fragments of divine revelation into a harmonious whole to be used in spreading right thinking and right living among mankind. Thus they combined the thought of the Orient and Occident, from which fact we draw the name of this degree. 18º – KNIGHT ROSE CROIXThe ceremonies of this degree are interpreted by each individual according to his own faith, for in no other way can Masonry retain its universal character. The cross has been a sacred symbol of earliest antiquity among many nations with various meanings. The Rose is the symbol of dawn, of the resurrection of life. Together the rose and the cross represent the dawn of eternal life. In all religions there is a basis of Truth; in all there is pure Morality. All that teach the cardinal tenets of Masonry, we respect. Masonry also has her mission to perform. She invites all men of all religions to enlist under her banners and to war against evil, ignorance, and wrong. The Nineteenth through the Thirtieth Degrees are Philosophical and Chivalric. They fortify the truth seeking Candidate with arms of Faith, Hope and Charity with which to fight the enemies of Intolerance and Oppression. They remind one how indispensable to human progress is the inviolability of the right of personal liberty and private property at the hands of a fearless independent judiciary. Masonry teaches that every idler ought to hasten to some field of labor, manual or mental, as a chosen and coveted theater of improvement. Their doctrine is of one devotion to the service of God, and zeal and constant endeavor for the welfare of men. They teach an intellect enlightened by study, audacity which nothing checks, a will which nothing can conquer, and a discretion which nothing can corrupt or intoxicate. Also, that ignorance can corrupt into falsehoods the truths of religion and philosophy, and that it is the Grace of God, His goodness, beneficence and mercy, which gives the Masons of these degrees their distinctive name. Times and circumstances may change, but virtue and duty remain the same. Symbolic Masonry does not claim to have either philosophy or religion but is the champion of the right of free conscience in religion. The Cross of Saint Andrew has always been the emblem of Charity and Forbearance for the weak, the poor and the helpless. The last of the Degrees, the Thirtieth, humanizes the old lesson of vengeance. 19º – GRAND PONTIFFThis is the first Degree of the Council of Kadosh. In it the fact of the influence of the past upon present and future is forcibly exemplified. All good men hope to live after death through the work they have done. 20º – MASTER OF THE SYMBOLIC LODGEThis Degree teaches that as Grand Master of all Symbolic Lodges, it is your special duty to aid in restoring Masonry to its primitive purity. You have become an instructor and as such it is your duty to instruct your Brethren of the many constant lessons to be learned, teaching the lofty qualifications which are required of those who claim them; remembering always, that real Masonry requires of no man anything to which a Knight and Gentleman cannot honorably and without feeling outraged or humiliated, submit. 22º – KNIGHT OF THE ROYAL AXE or PRINCE OF LEBANONThe lessons of this Degree have made the working man and his associates the heroes of her principle legend and himself the companion of kings. Labor is man’s great function, his peculiar distinction and his privilege. He pours his own thought into the molds of nature, fashioning them into forms of grace and fabrics of convenience, and converting them to the purpose of improvement and happiness, but greater than these, every man has a work to do in himself, upon his own should establish intellect, and attain the highest nobleness and grandeur known on earth or in Heaven. 23º – CHIEF OF THE TABERNACLEThis Degree calls upon you to make a formal declaration that you will be obedient to your superiors, you will keep your body pure, govern your tongue, and observe a passive obedience in receiving the doctrines and traditions of the Order. The moral lesson being a devotion to the service of God, an interested zeal and a constant endeavor for the welfare of men. 24º – PRINCE OF THE TABERNACLEMany who think themselves Freemasons know not the meaning of the ceremonies. They do not even comprehend the symbolic charts, nor understand the hieroglyphical signs with which the walls and ceilings of their lodges are ornamented. Observe the four words of the Magus, written in four symbolic forms of the Sphinx; an intellect enlightened by study, an audacity which nothing checks, a will that nothing can conquer and a discretion that nothing can corrupt or intoxicate. Every Freemason is a priest and in this Degree you are consecrated as a priest of trust, of toleration, of philosophy, of rational liberty, to the service of God and to that of men, as ruler, teacher and benefactor. 25º – KNIGHT OF THE BRAZEN SERPENTIn this Degree, we find the moral lessons of some of the older religions taught with vigor, especially that of the mystical death which symbolized the descent of the soul into the infernal regions and afterwards its rise to the stage of light, truth and perfection. 26º – PRINCE OF MERCYThe true purpose of education is to cherish and unfold the seed of immortality already sown within us: to develop, to their fullest extent, the capacities of every kind with which God who made us has endowed us. 28º – KNIGHT COMMANDER OF THE TEMPLEPractical charity, knightly attributes of Character and a scorn for the base and selfish are but a few of the lessons taught in this Degree. Truth and honor are more to be cultivated than the gathering of wealth and power. Let us ever remember our duties to the poor and helpless, the weak and unhappy. 29º – SCOTTISH KNIGHT OF ST. ANDREWThe cross of St. Andrew has always been the emblem of humility, patience and self-denial, and even more than these, that of charity and forbearance for the weak, the poor and the helpless. The knights of old held virtue, truth, and honor to be the most essential qualities of character. 30º – KNIGHT KADOSHOf all the Degrees of the Scottish Rite, we should consider this as one of the most important. If in death there is life, then the great martyrs of History live indeed in the hearts of the followers after truth. This Degree particularly teaches the great necessity of combating arbitrary and unscrupulous power and all influences which would keep the people in ignorance. A thirty-second degree Mason, a Sublime Master of the Royal Secret, can and should add a great deal to the image of Masonry, both to the outside world, and to our fellow Masons. The lessons portrayed have been an embellishment of your previous Masonic life, one void of the apathy and lethargy which is so evident in today’s society. Vow that henceforth you will take neither your heritage nor Masonic life for granted, but rather will illuminate them with the teachings of Masonry. You can thereby become a valuable member of our Scottish Rite and a contributor to the image of the greatest fraternity ever known to man. 31º – INSPECTOR INQUISITORThe title of this Degree conveys the thought of self-examination. Every man, and more especially every Mason, should ponder prayerfully and soberly on his thoughts and acts of the day. The wrongs of today must not be repeated on the morrow, for each day should add some light and truth for our guidance for the next. 32º – MASTER OF THE ROYAL SECRETIn this Degree, the Royal Secret, like the occult science of the ancients, is concealed even here. Today, as in the first days of the creation, the universal equilibrium still retains its predominant position in the eternal plan of the Omnipotent. Good and evil, right and wrong, justice and mercy, attraction and repulsion balance each other to teach us to remember ourselves as immortal souls, retaining for each other respect and charity and remembering always that each is slowly climbing to the State of Perfection, the final Goal for all.